If you're like most Americans, those words probably conjure up that dry unit on nineteenth-century immigration from your tenth grade history course. Covered wagons slowly trekking west. Indians using all the parts of the buffalo. Things like that. However, if you are the product of that privileged generation of Americans born, say, between 1982 and 1988, those three words bring back the glories of 16-color DOS computer games, back when floppy disks actually flopped. My sister is teaching middle school students, and she recently informed me that few of them have heard of MECC's The Oregon Trail. My younger sister, born in 1992, told me she only knows about the game because of me. But find nearly any American child who went to elementary school in the late 1980s or early 1990s, and they've experienced the joys and frustrations of the Trail - caulking and floating the wagon, the lame hunting minigame, the ever-present thieves, broken axles and bastions of wild fruit. I mention this because I've been remarkably nostalgic for the 1990s recently. I'm not quite sure where it came from. Part of it might stem from my forays into Green Day and Nirvana earlier this summer, both of whom bring back memories of second grade. By I think part of it is also the shifting zeitgeist. If the aughts were the decade of eighties nostalgia - the ironic power ballad-themed karaoke nights, the Michael Bay reboots of old cartoons, the return of Knight Rider as a viable piece of programming - then I predict that this dawning decade will be the heyday of nineties nostalgia. We will bring back grunge music, treat Family Matters like the classic it is, reminisce about Hotmail and Geocities, and all other generations shall flee in fear from our wistful recollections. The signs of the nineties revival have already revealed themselves on the Internet. I discovered this one night while watching old Capri Sun commercials on Youtube. Apparently there's a big market for old kids' commercials from the nineties - Youtube is full of medleys of them you can watch. Remember Nickelodeon magazine? Monster in My Pocket? Mighty Max? Not only that, but our ability to jog our collective generational memories is better than ever before. Ten years ago, if I had wanted to watch an old episode of Doug and reminisce about the good old days in the Honkerburger, I had no viable option. Now, there are plenty of full Doug episodes on the Internet for instant streaming. If I forget the lyrics to "Happy Happy Joy Joy," a memory jog is just a mouse click away. Every generation not-so-secretly believes that their childhood was the best time to grow up in America. This is why we're still subjected to annoying Boomer nostalgia about Woodstock over forty-five years later. I certainly believe this is true of my own generation - we had Family Double Dare, Super Mario World and Goosebumps books. We had the Internet when it was exciting and not annoying. We grew up without cellphones. We had Sony Discmen, dammit, and in my own deluded memories they were awesome and never skipped. And we had the Oregon Trail...for whatever reason. I played a game last weekend and it occurred to me how un-educational that game really is. You were supposed to talk to people and learn history and decision-making skills and stuff, but every kid just set their pace to "grueling" and hunted thousands of pounds of buffalo meat that they didn't need (though, come to think of it, that last part might be historically accurate). I'm not sure what quirk of pedagogy put a copy of the Oregon Trail in every classroom in America. But everyone of a certain generation has played it. In a way, it's like a secret handshake. 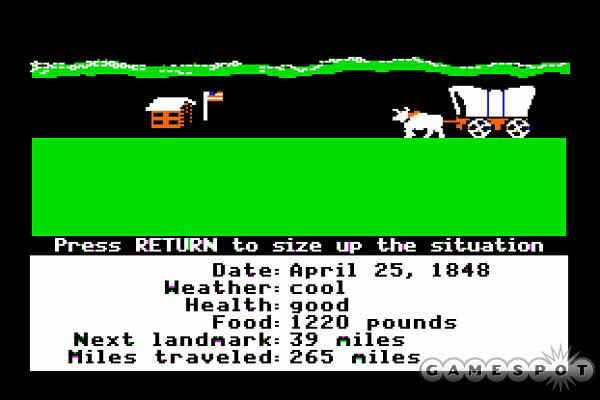 I can meet any American between the ages of 22 and 28, and they can talk to me about the Oregon Trail. America is a big country, but there are strange generational touchstones that pull us together. Walk up to anyone of this age and recite a line from the theme song for Salute Your Shorts ("Camp Anawana, we hold you in our hearts"), and they will respond, almost involuntarily, with the next line ("When we think about you, it makes us want to fart!"). So, even if we have nothing else in common, I feel a kinship with anyone whose oxen drowned in the Snake River. And let's enjoy our revival while it lasts, because in ten years people are going to hate what the nineties stand for. Is this nostalgia annoying? Of course it is! So let's embrace it, and enjoy the last gasp of the nineties before it fades into irrelevance forever.